Deluxe model with cushioned pad and tapered design. Made of cool, smooth nylon and elastane, the Oasis comfortably allows your arm to move freely, and protects your finish from skin chemistry and wear due to friction. 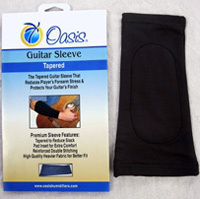 The Oasis Premium Guitar Sleeve is an easy way to protect a valuable instrument and improve playing comfort. This item makes direct contact with skin and does not fall under our normal return policy and non-returnable. Please double check measurements before ordering. I have had a guitar sleeve the last few years (the OH-8M) which has stood me in good stead, but is losing elasticity. I thought I'd try the deluxe version. In all both are good sleeves, and I'll certainly get another eventually, but I would probably go with the less-expensive one. Oasis "Premium" Guitar Sleeve is not better than nothing! The pad is too thin and does not effectively distribute the pressure from the edge of the guitar over a wide enough area on your arm -- so it can still hurt. The sleeve will not stay in place. It slides down toward your wrist after a short while. They could improve it be using a 1/4" gel pad and put some grippers on the upper end of the sleeve. Sleeve will not be useful. My hope was to find a well fitting sleeve that would provide padding adequate to prevent hand tingling (from pressure on forearm nerves) when I play for a while. I did measure my forearm and ordered the recommended Medium size sleeve. Due to lack of snugness and slippery fabric, it does not stay put and slides down my forearm as I play. Additionally, the padding is quite thin and does not adequately protect my forearm from pressure. The sleeve will not be usable by me. The Oasis Premium Guitar Sleeve is a fine sleeve. It will protect your guitar from sweat. It fits nicely and feels good against the skin. But I tried the sleeve specifically hoping the cushioned pad would help to alleviate some carpal tunnel related discomfort in my forearm. Unfortunately the cushioned pad just isn't substantial enough to provide the cushioning and support I was hoping for. It is a fine guitar sleeve if you don't suffer from carpal tunnel related discomfort. But if you suffer from carpal tunnel syndrome and need a sleeve to offer more cushioning and support against the edge of the guitar, try a padded athletic sleeve from a sports outlet. Both Nike and Under Armour make forearm shivers/sleeves/pads and elbow pads which will help with carpal tunnel related discomfort in the forearm. Comfy and smooth. The pad is a nice feature.